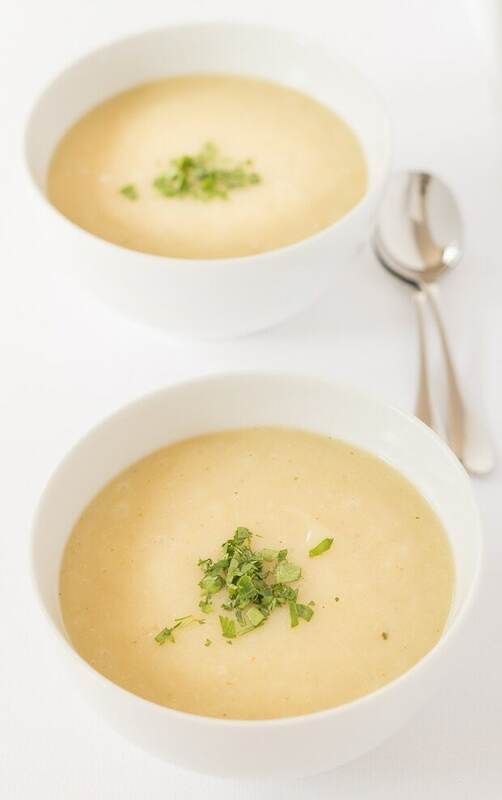 This roasted garlic onion potato soup is made from just 6 ingredients, it’s vegan and is a perfect way to use up surplus potatoes. This roasted garlic onion potato soup is one of my ideal “what’s left in the kitchen cupboard” recipes. I just know that you’re going to love it! It’s an easy, tasty variation of the classic potato soup recipe, adding a bit of a twist with the roasted garlic. And it all comes together as a bowl of simple, low cost nourishment! Plus it’s thick and creamy, but made without any cream. That makes it fat free and low calorie. It’s a great comforting bowl of goodness on a cold winters day! And talking about cold winters’ day’s. 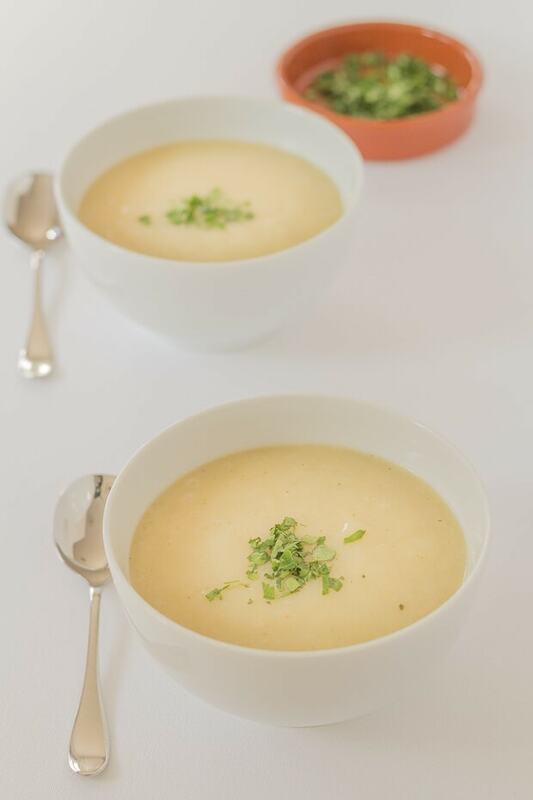 If you liked this roasted garlic onion potato soup, you make equally love my Scottish leek and potato soup! My last blog recipe update, kale and pepper frittata, ended with a note that “change is afoot” and I didn’t want to go into too much there, and I won’t bore you here with all the details now. I will just simply say that my blog schedule of posting 2 new recipes weekly, on Tuesday and Thursday may not always happen over the coming weeks as I am leaving my current employment on 28th November (I’m taking voluntary redundancy) and seeking a new opportunity. So I’m sure you’ll understand this will now take priority. If I’m not able to post a recipe update, bare with me. I love doing my cooking and sharing me recipes with you, but it doesn’t pay the bills. Yet! So, moving on to the weekend! Lynne and I hope that we can get out for a walk in The Lomond Hills on Saturday. These hills are situated in Fife and if you can see off them, then you get a fantastic view of the surrounding fife farming countryside and can even see as far as St. Andrews and Leven. Anyway, it would be good to practice my outdoor landscape photography and actually to get some good clean fresh Scottish air. Catch up with you all next week and have a fantastic weekend! 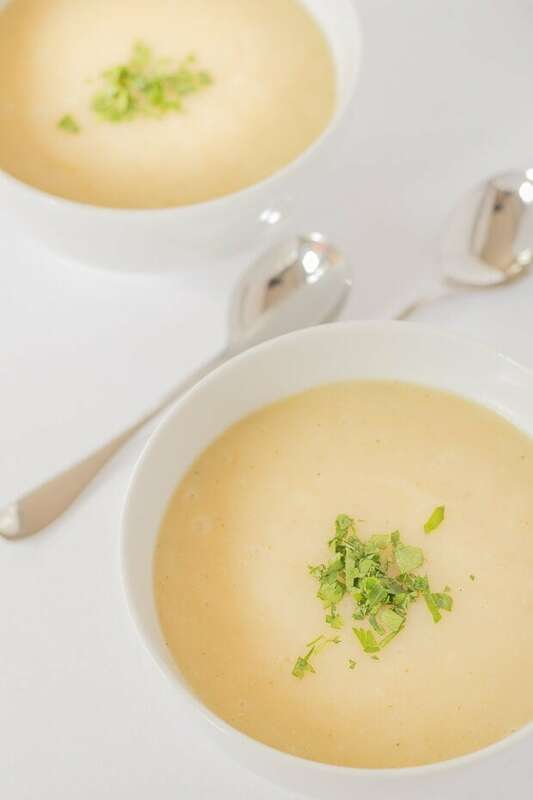 This roasted garlic onion and potato soup is a perfect way to use up surplus potatoes. It tastes delicious and creamy, but isn’t made from any cream! 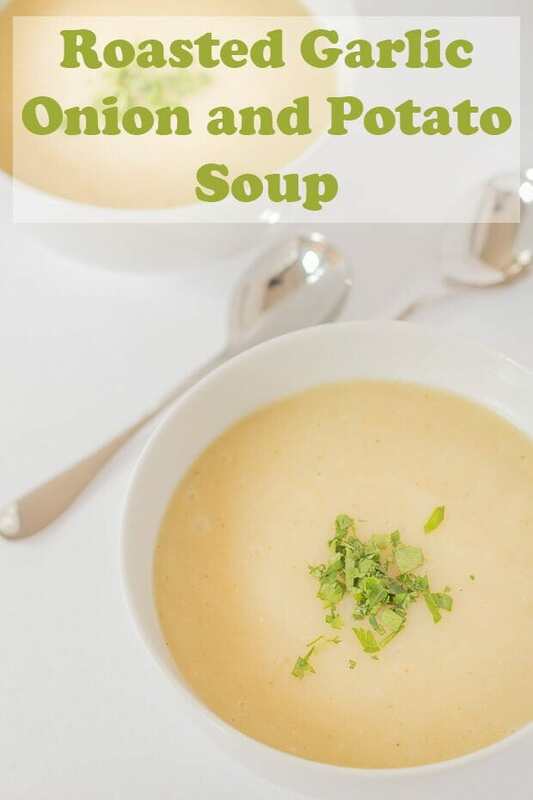 This roasted garlic onion potato soup is made from 6 ingredients and is a perfect way to use up surplus potatoes. Make a parcel with tin foil and place the garlic cloves in it, spray them with a little oil spray and roast in the oven for 15 minutes. Remove from oven and allow to cool a little so parcel can be handled. Spray the bottom of a large saucepan 5 times, turn the heat on high and when the oil starts to bubble turn the heat to a medium heat and add the diced onion. Sauté for approximately 5 minutes. Once the garlic parcel is cool enough to handle remove the roasted garlic cloves from it and squeeze the soft cloves out of their skins adding to the sautéed diced onion. Add the chopped potatoes and vegetable stock to the saucepan. Cook for about 15 – 20 minutes until potatoes are soft and then turn off the heat and allow to cool a little. Blitz the mixture in a food processor, return to the pan and season to taste. 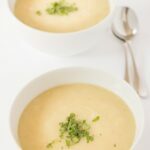 Most potato soups I have tried have always had some form of dairy in them – so I am loving the roasted garlic and the lack of dairy in this potato soup. Wishing you all the best as one chapter closes -and I am sure another opens – hoping you ind the right new opportunity for you soon! I’m glad you like the soup Shashi, thanks! The roasted garlic is just such a simple touch, I love too, which I find sweetens up the soup instead of cream / milk. What is the serving size??? Hi Allie, the serving size is in the recipe card, near the top left. you’ll see it says “4”. That’s the number of equal portions you’ll get if you use the quantities of ingredients exactly as in the recipe card. Thanks.